My experience: Swift is the internet provider we use in my house. The network is somewhat fast. Most times I’m able to watch youtube videos and series online. 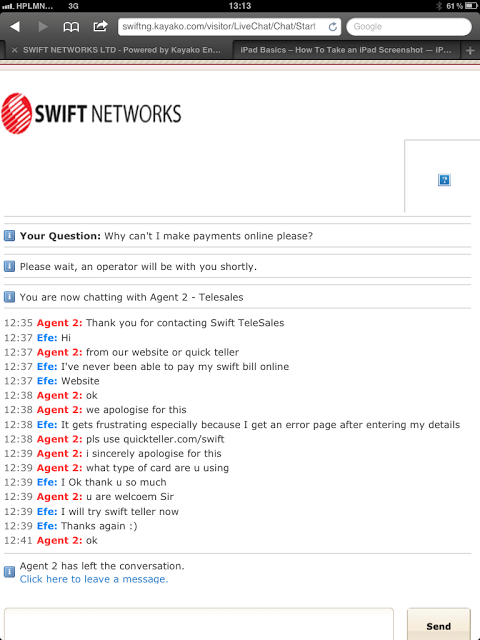 Today, the network connection got cut off and we were trying to pay via the Swift website but it wasn’t working. My dad then complained that he has never been able to pay his Swift bill online, but he keeps trying and that the process is “very frustrating” because it hooks at the last minute (after entering one’s personal info, card details, etc.). So I went online to chat with a Swift representative about the problem. Below is a screenshot of the chat. I was actually impressed! I thought the representative was polite and understanding. Also, I had never heard of Quickteller but it worked! By the way, Quickteller is a service that allows one to pay, send or receive money from any location. Although you need a Verve or Nigerian Mastercard, you can pay almost any bill (mtn, dstv, phcn, etisalat, glo, starcomms, etc.) without having to go to the bank using Quickteller. All you have to do is create a Quickteller account (and this process took me less than 2 minutes). have you ever tried walking in at their office on saka tinubu? JESU!! on the two occasions i went there the front desk lady is really awfully less concerned about what you have come to do. She looks at you rudely as if you are intruding her space. I agree with your review above. I actually worked at swift in my first year during the holidays and their business is 100% consumer oriented. The lady in charge of their customer service always told the engineers that swift's selling point dwells on their quick response to the complaints of consumers .Swift always endeavours to respond to their clients complaints within 24 hours.